Here's a mini-interview I did with Carolina - enjoy! How did you get started embroidering? I started embroidering a few months after I had to stop tattooing, after seeing many tattoo-inspired embroidery on Flickr. What type of embroidery appeals to you most? Everything inspires me to create, but I'd say tattoo art, comic art and art nouveau are my main influences when it comes to design. To learn more about Carolina and her embroidery patterns, visit her blog, Shabby Digital: http://shabbydigital.wordpress.com/ Thanks Carolina! Autumn is here, September is already ending, but the best is yet to come...October! 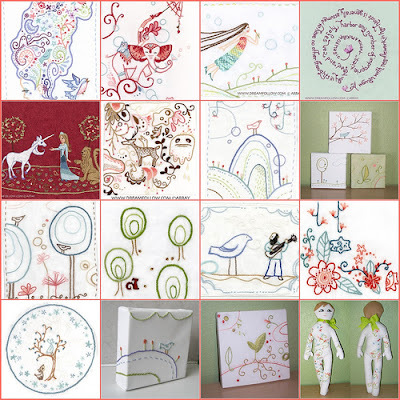 Feeling Stitchy is now beginning a monthly theme or challenge for all stitchers interested. I guess you probably know what this first embroidery challenge is, yes Halloween! 1. 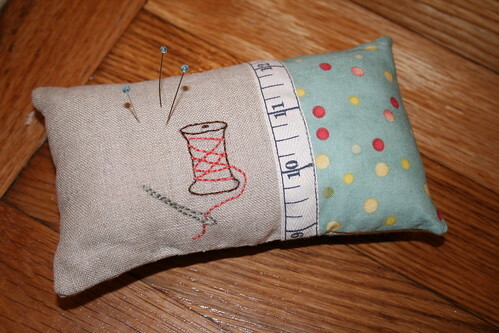 Stitch on any item you want: t-shirt, pincushion, wall hanging, candy bag. Just stitch a Halloween design. 2. Post a picture of your work at the flickr embroidery group with a statement about your piece, possibly even where you found the pattern. 3. 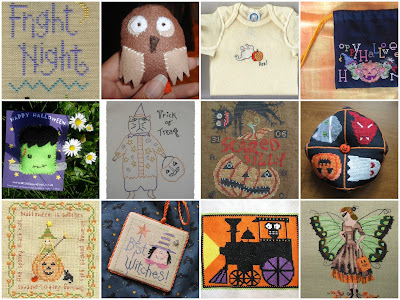 Tag your photo "Halloween Stitchery" so that Feeling Stitchy can highlight some of the work. 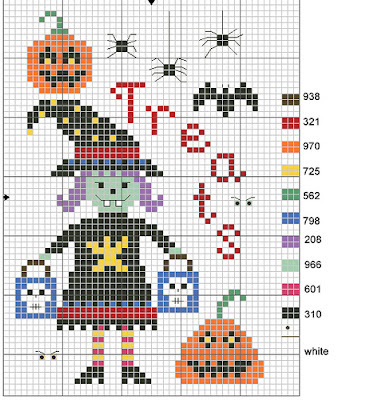 The Halloween pattern, pictured above, was provided by Emily - visit her blog if you want a PDF version. Thanks Emily, way to get the ball rolling! Here is a mosaic full of inspiration. It is already posted at the flickr embroidery group and you can find out who created these great pieces. 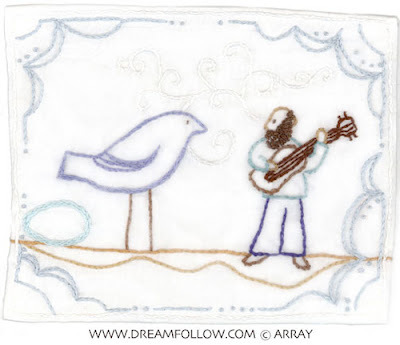 I'm always amazed at how many new projects are added to the embroidery pool every week. Maybe it's because we have grown to such a large group now! Here's a few projects that caught my eye. First up - Amanda also known as BugnBit has embroidered this funky flower onto some jeans. Very cute. This set of vintage 'his and her' images are gorgeous. Melinda (also my middle name for all you trivia buffs out there) posted them to our embroidery group. I love the lady in the shower. What's happening in the pool? There are so many cute things, I don't know where to begin! 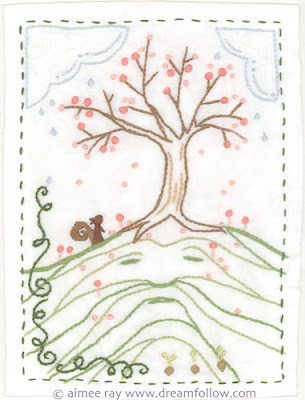 This lovely cherry blossom has been stiched by Melissa from binah06. She has heaps more cute embroidery on her profile, so go and take a look. Rachel (also known as burb_mama) recently finished this cute little girl picture with a really sweet border. Melissa (yes! another one!) from sunnydayshere is stitching this gorgeous little car on a tote for her nephew. 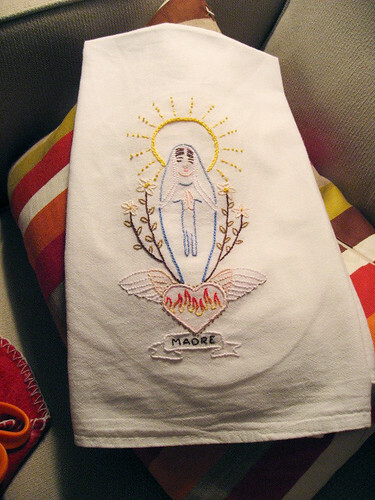 Q. Aimee, how long have you been embroidering and how did you get started? A. 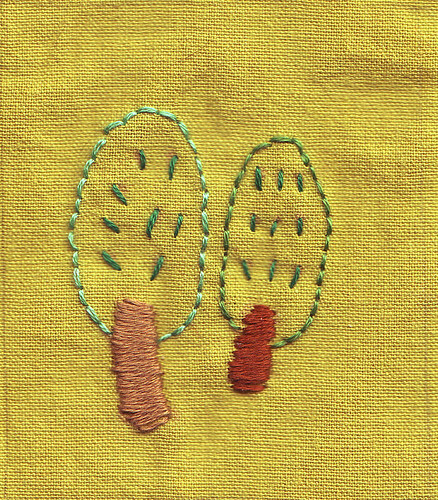 My grandma first showed me how to embroider when I was about 5, she used to bring samplers for me to work on whenever she came to visit. I hadn't done any embroidery for a long time though, until a few years ago when I picked it up again and started stitching some of my own designs. I am a greeting card designer by day so I do a lot of computer art and design. I think one of the things that drew me to embroidery was that it is so completely opposite from that! It is an age old, primitive art form, but easy to pick up and adapt to contemporary art styles. I also find it sort of relaxing and meditative, and a great project to work on just sitting on the couch,watching a movie. Q. I have been admiring your work on Flickr; you create some wonderful trees. Do you get a lot of inspiration from nature? A. Absolutely! I've always been a nature girl, I love to be outside. Animals and nature are endless sources of inspiration and trees are one of my favorite things to draw or stitch. Q. I noticed you have a degree in graphic design and illustration so I imagine sketching comes naturally. What started the process of you sketching with thread? A. I have always done random sketches in my sketchbooks, usually tiny and done with very little thought- almost stream of consciousness. :) They can be actual drawings of things or just abstract shapes and lines. I guess it just struck me one day that some of them might make cool embroidery art, so I blew one up and transferred it to fabric. These have become some of my favorite embroideries I have done. I always use removable transfer pens so I can improvise or expand on my original sketches. That way I have a basic design I like to start with, but I'm free to add or change things as I stitch. Q. Speaking of sketching with thread, you have a book out, Doodle Stitching. Congratulations! Can you tell us about the book and what we might find in it? A. Thanks! It's been great seeing it finally out in the world! Doodle Stitching contains all kinds of my original embroidery patterns, each one with instructions for a fun, easy project to stitch them onto. There is also a section describing the tools and materials you'll need, as well as illustrated instructions on how to create many different stitches. So whether you're just starting out embroidering, or have been at it awhile, I hope you will find something there to inspire you. Q. Could you give some advice for those who do not have an art background but would like to create their own embroidery designs? A. Doodle as much as you can! 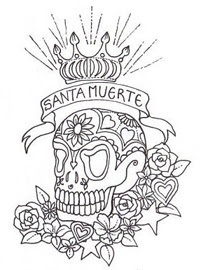 Seriously, simple line drawings make great embroidery patterns. You may not think you have great drawing abilities, but some of the coolest embroideries I've seen are just simple patterns or line drawings with some creative thread work. Kids' drawings work great too. Don't be afraid to experiment or make a few mistakes. Q. What other interests do you have besides crafting? Q. Your embroidered canvases are wonderful; what a great way to display your pieces! Was the embroidery created on fabric and did you do anything special to stretch it over the canvas? A. Some of them are fabric, and I just stretched them over the wood canvas frame. For others, I took the canvas off of already-stretched canvases and stitched directly onto that. It's already the right size, and it's stiff so you don't need a hoop. When I finished, I just stapled it back on the frame. I like displaying my embroideries this way, for some reason I've never really liked putting them in picture frames behind glass. Q. What is an average day like for you? A. I go to work at my day job, come home and walk my dogs, then work on craft projects! Scattered throughout my daily routine is lots of Internet browsing and drawing or writing random things in my sketchbook. I've recently done a small series of illustrative "portraits" of some of my childhood heroes, starting with this one of Shel Silverstein. Embroidery seems the perfect medium somehow to commemorate these fabulous people. Perhaps because I learned embroidery as a child. Others in this series so far are Crystal Gayle and Jacques Cousteau, with more to come. "hill man" is probably one of my least abstract embroideries. I love fantasy, which probably leads to my envisioning faces in nature. I love for my artwork to be narrative, for it to tell a story of its own. I see lots of potential stories in this one. I don't like to explain too much, but let the viewer find their own story in my pictures. Thanks so much Aimee, your work is wonderful! To check out more of Aimee Ray, go to her website, dream follow. And you can also purchase Doodle Stitching at her Etsy shop! Looking for some inspiration? 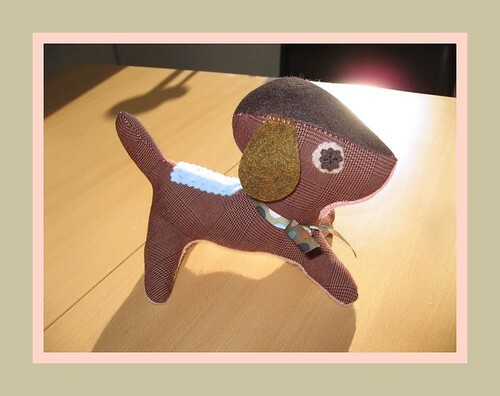 Why not try this new book, Softies: Simple Instructions for 25 Plush Pals, written by Terry of Softies Central fame! There are SO many fun patterns it's hard to know where to start, and all the directions are very carefully explained. For example, I finally learned why my corners are never properly rounded - I need to clip the seams! Each pattern tells you what kind of skills you need and there are plenty of embroidered softies to be found. You'll see many beginner-level projects to start out with and there are also some wonderful, challenging patterns for more "advanced" crafters. The pattern directions were so clear and helpful that it was actually almost perfect, even though this was my first 3-d softie! The legs, or "bottom view" are less than perfect because it was 2 in the morning, I was sleepy and cranky and stopped following the instructions. Don't be like me - follow the instructions, and do try this book out for some amazing softie inspiration! Although it's getting warmer here in Oz, it's not quite warm enough for a swim! Here's some fun stuff I found in the embroidery pool this week. Wardi has posted some lovely seasonal embroidery, including this one called Seasons. Need some inspiration for a new project?